Gods of Egypt is released on DVD, Blu-ray and Blu-ray 3D on October 24th And to celebrate we have a great competition for you and 3 copies on Blu-ray 3D to give away. 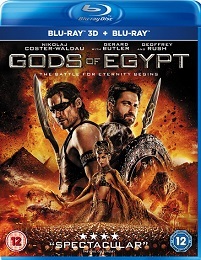 Gerard Butler and Nikolaj Coster-Waldau star as warring Egyptian gods in this fantasy adventure, directed by Alex Proyas. Set in an alternate Egypt where deities live among mortals, the desert God Set (Butler) rules over the kingdom after killing his brother Osiris (Bryan Brown) and seizing the throne from its rightful heir, his nephew, Lord of the Air Horus (Coster-Waldau). Tired of being subjected to Set's ruthless reign, mortal thief Bek (Brenton Thwaites) and his lover Zaya (Courtney Eaton) devise a plan to free Horus from his exile and convince him to once again battle his uncle Set. Together, they try to amass enough power to take down Set once and for all and put an end to his reign of terror. Upon hearing of Horus' plan, Set prepares for their impending duel by obtaining power from all of the gods who have refused to accept his rule and conquering their domains.